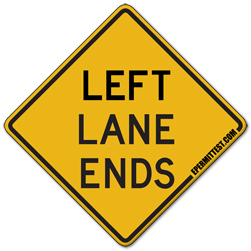 The "Left Lane Ends" traffic sign tells you that left lane on roadway will end ahead. You are required to merge right. This road sign is frequently installed in advance of the upcoming road work zone.